The owner of Royalty is a good friend of Yuseff's sister. They have been using them for all their kid's birthday celebration so we're no stranger to their food. We knew from the start that we wanted to get them so we're happy we found a venue that doesn't need to have accreditation for everything. The food was great and abundant, everything we discussed were done. Great food and service! This rating is only based on our communication with them and output during the day. We still didn't have the final edit so I'll update when we get those. I love the photos we got. We provided a hard drive and got our photos that night. Not much editing was needed. they gave us round 4k ++ photos. With that alone I think their fee is worth it already. But the SDE, it's amazing. I love it!! Some of my friends thought that we got a super expensive photo/video team because of the SDE. :) The only reason I didn't give a perfect rating is communication. Text and emails doesn't alway get a response. But I fully understand that their busy, and once the wedding date drew closer, they responded much faster. I still say that I love their work, and their team is great to work with. UPDATE: Already got the final video edit and I love it! What a nice way to look back at our wedding day. I've read a lot of forum to helped me in choosing suppliers, especially the host since it's difficult to find sample videos of hosting styles of the emcees. 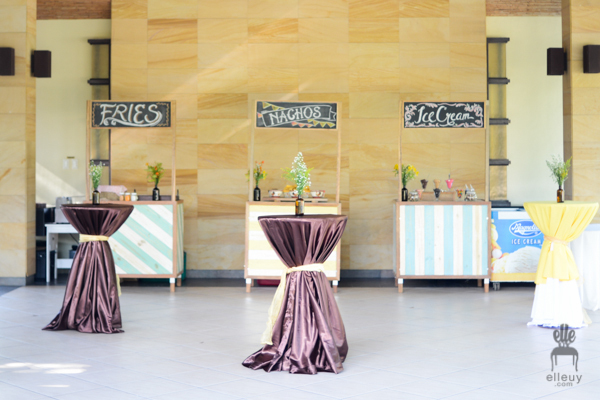 After reading tons of positive reviews, we chose Joy since we wanted a fun vibe for our reception, nothing too formal. She did great! She made us laugh, cry, and sometimes, both at the same time. Haha.. Her voice did command attention, and she sings amazingly well too. We got her package with JMI L/S and they are great too. Clear sound and nice ambiant light all around. 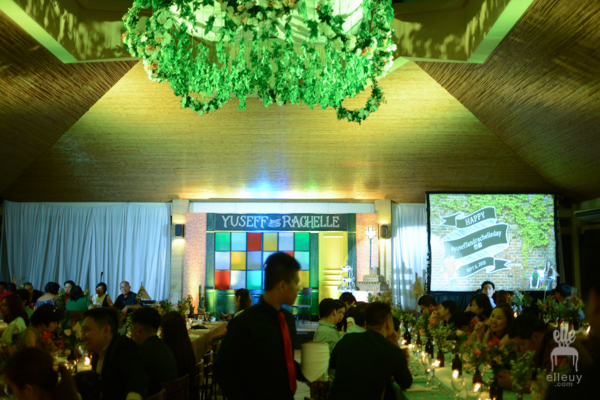 We didn't used the venue's main light since they are too bright, so our main source of light the entire night was from their team. It's also a good idea to get a host and L/S that worked well together since they'll be working very closely and both Joy and JMI gave us a fun reception. I did the design for the invitation but I had my friend printed them out. But she also do the designing and she's really great. You should see her own wedding invites, it's too cute! Hehe.. We only got her printing services but she also do a full package. She's also OC with details so that's a good thing. I do not want to tackle all the ceiling design so I asked my friend to do them for us and she did a great job. 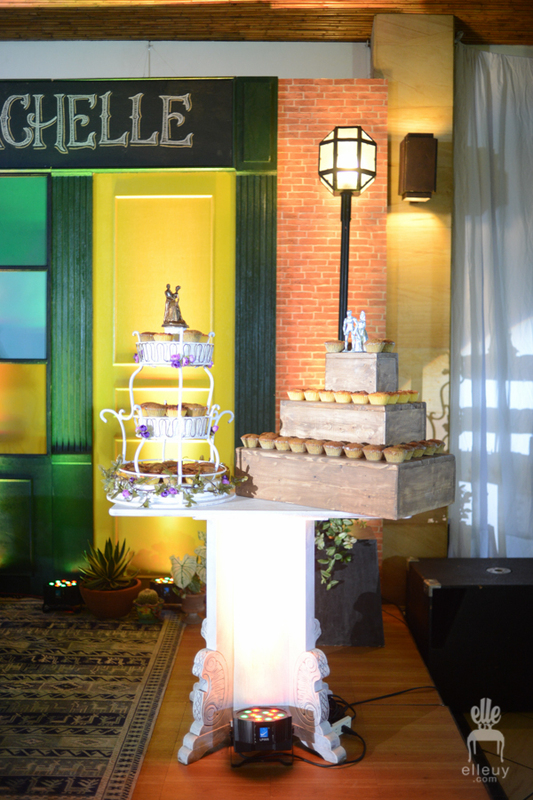 She really does full event styling so I'm guessing our requirement is quite easy for them. Haha.. Aside from the ceiling, she also did all the drapes for our wall. I just told them that I wanted a bohemian feel and I left it all up to her. So happy with how everything turned out! 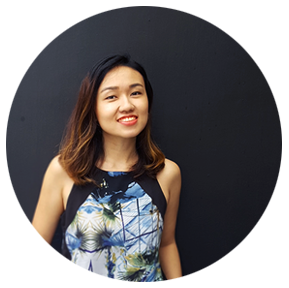 I knew from the start that I wanted a very light make-up with soft loose waves for my hair. Simple and fresh was the peg. Berny and her team are so professional and so easy to work with. The only reason I didn't gave a perfect score was I find it difficult to manoeuver my hair. Hehehe.. I'm envisioning a soft waves where I can run my hands through my hair, but I think that's not possible. To achieve the wavy look, they need to put in hairsprays or else it will be straight even before the ceremony ended. hehe... I love the look, looks great in photos, and very professional team. I mostly communicated with them through email and they responded fast. Very clear projector, and it's huge. Haha.. I love it. the -.5 was just because the placement of the screen wasn't on an angle, which left one table difficult to view the screen. But I guess they have no choice since we've got a tight space and there's only one option to place the projector. But overall, great service. Again, got this service from my friend. Wow, we've got a lot of supplier friends. Haha.. Anyway, they also does full package, but as for us, we just got the equipment / printing services. We did the backdrop, and layout design ourselves. But they did the backdrop for one of our friend's wedding and it's great too. That's mainly our suppliers, since most we DIY'd or bought retail. As for the budget, which is a big concern for most people planning their wedding, we tried to keep it low without sacrificing the experience. That's it. Series finale for all this wedding related thing. I can finally move on and share the Tiny House! Haha.. 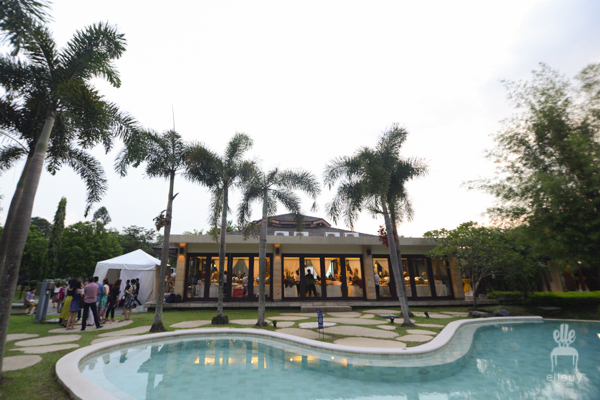 Speaking of this house, you can check out glimpse of it on our SDE. The look of the boys are all vintage inspired, we both love the look. They are in jeans to have that casual vibe. Yuseff loves wearing caps / hats, so they all wore one. As for the girls, I wanted bohemian. I love the look! 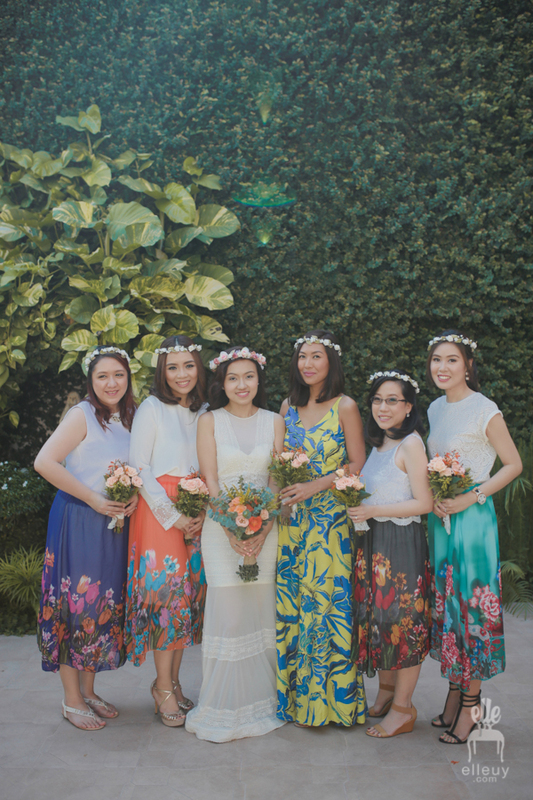 I bought the girls skirts in different colors, and my maid of honor wore her own outfit. I just asked her to wear anything floral-ish. Haha.. Also gave them floral crowns to at least unify the look. We didn't want everyone to wear the exact same outfit, so the boys were provided with bow tie and vest, and they wore their own jeans and shirt. For the girls, we just gave them the skirts and asked them to wear any white top. They were asking what kind of top, and I just told them ANY. Haha.. I don't care. I was actually a bit worried that the boys / girls wouldn't match at all. I mean, very muted vintage versus bright colorful florals? 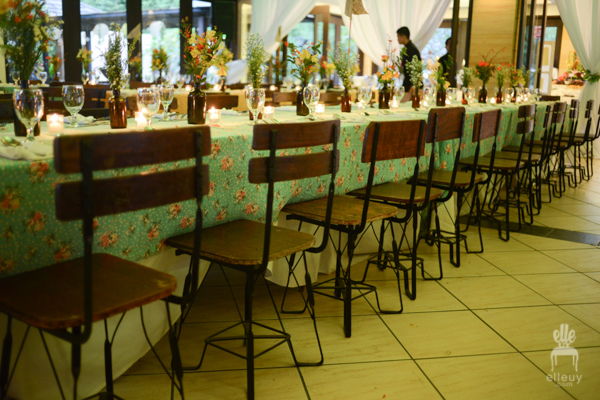 As for the venue styling, we stuck with our laid-back concept. 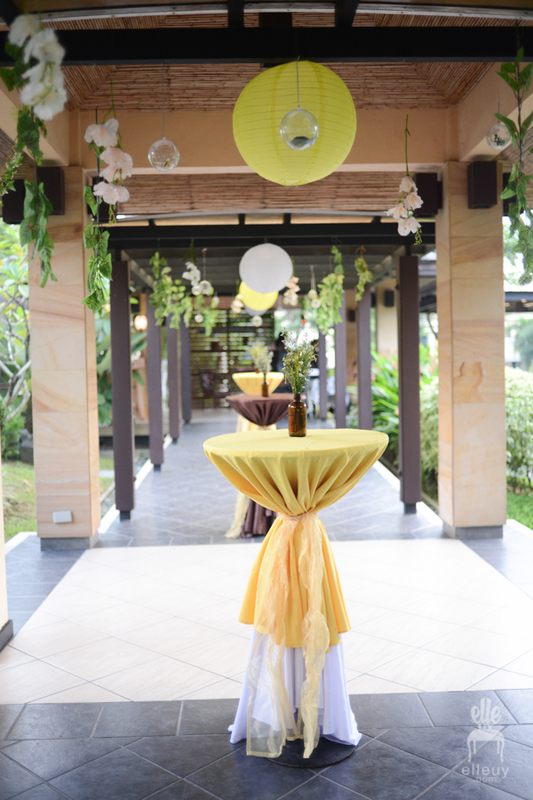 Even though we did everything in the exact same space, we wanted to have a different look for the ceremony and reception. We wanted both "event" to be special in their own way. 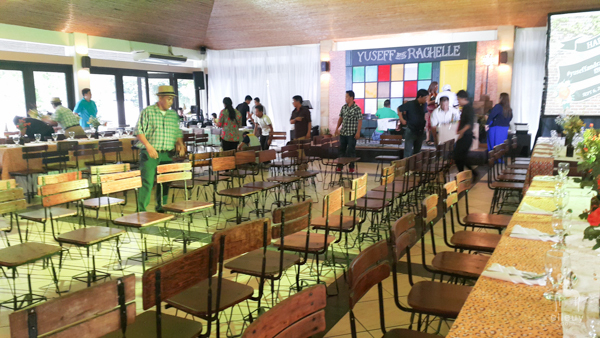 Since we wanted to have an actual aisle set-up instead of guests seating on their table for the ceremony, we had all tables set-up except for the two long tables in the middle to make way for rows of chairs to create the aisle. 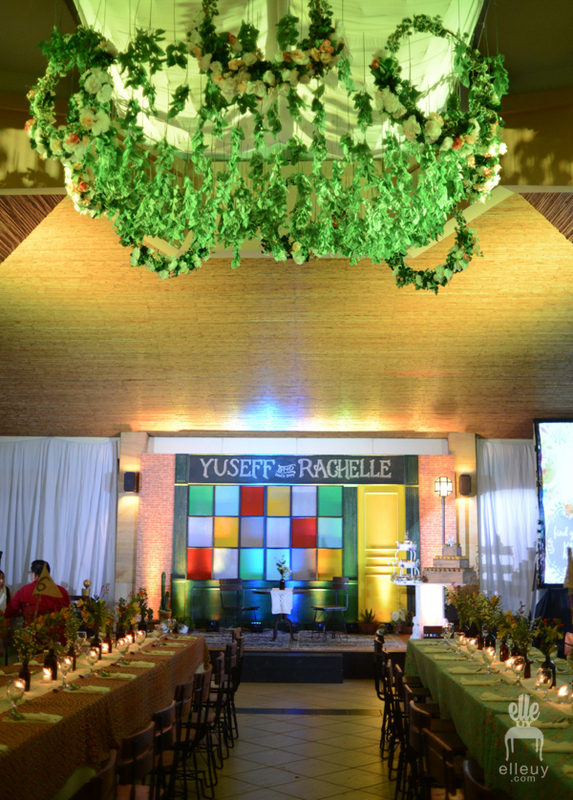 Once the ceremony was over, and guests went out for the cocktail hour, they set-up the middle tables, and removed the ceremony backdrop to reveal this. For the general feel, I just wanted it to be very bohemian and eclectic. So that was the overall concept, but there's a lot of details and DIYs that came with it. Haha.. Here goes.. 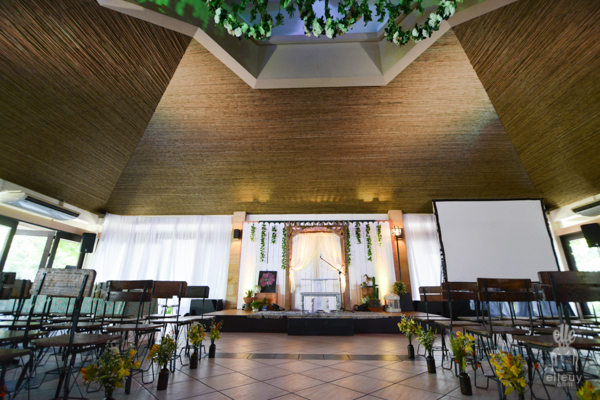 Originally, I'm planning to tackle the ceiling decor as well, but I came to my senses and realized that it would be so much easier to leave it to the pros since 1) The venue has high ceilings and we do not have scaffolding and 2) The allotted set-up time for everything was only 3 hours. So we got my friend's services to decorate our ceiling. She really does event styling so I left it up to her. 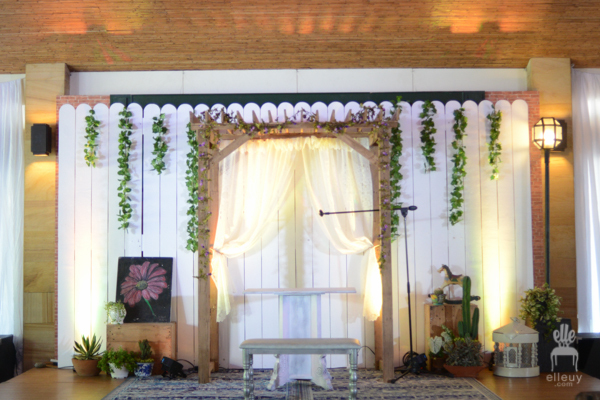 I'm not big on doing drapes since it doesn't suit our concept and I already love the venue's ceiling, so they concentrated the effort in the center. 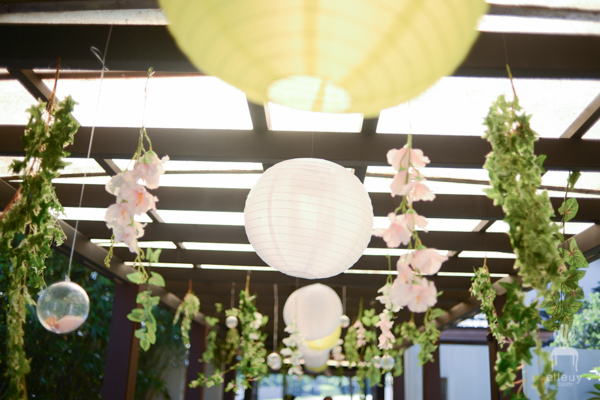 Love the hanging vines look! Very bohemian indeed. 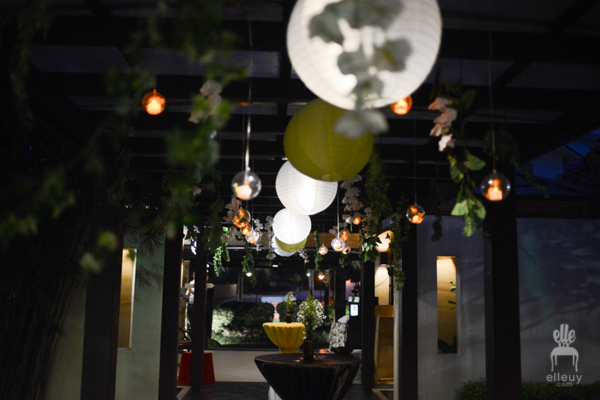 They also did the trellis outside the venue, and they did a very lovely job. 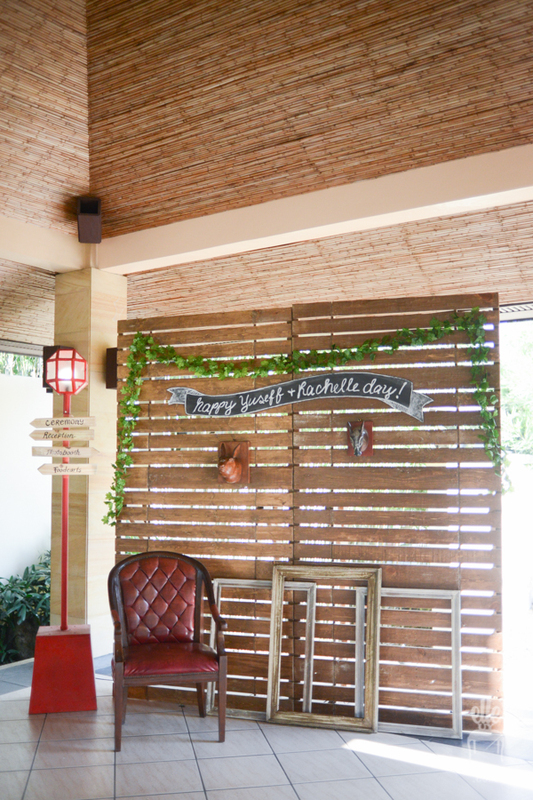 This trellis welcomed the guests and it sets the mood as soon as you step in. So here goes the longest part of this post. Yep, the ones above are just introduction. Now you know what I meant when I said this is going to be a very long one. 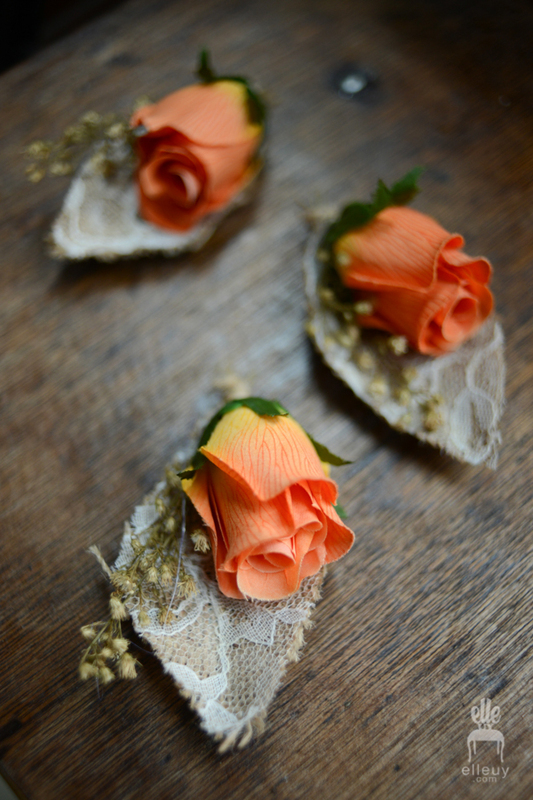 Haha..
We bought the faux rose for P10 each at Dapitan Arcade. They only have 2 colors available, hot pink and orange, so obviously, with the boys' vintage look, we went with orange. 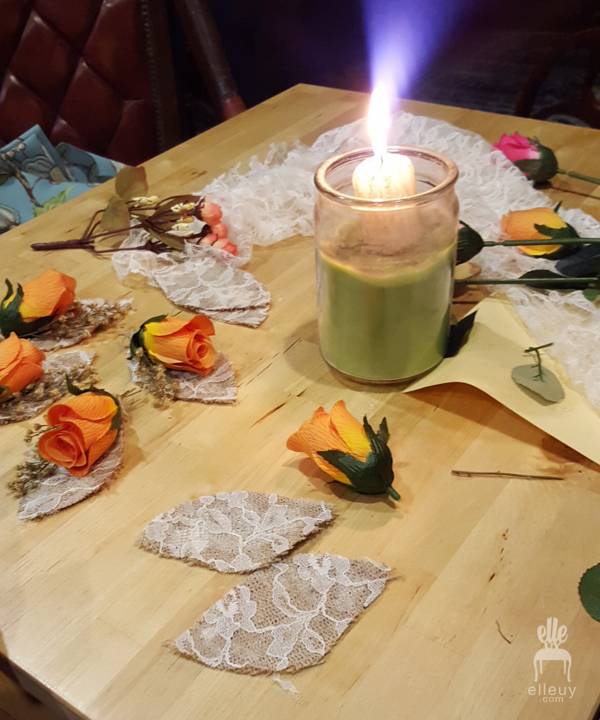 The burlap we already have since that's what I used for our flag table numbers, the lace that I laid over the burlap is an old skirt, and the fillers is a dried out babys breath that has been in the house for a month. Haha.. 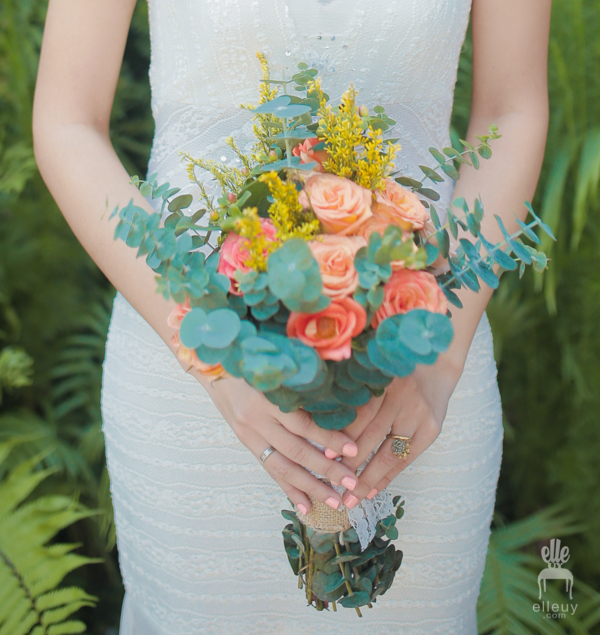 It's not planned, I just find that it's missing something and Yuseff suggested the babys breath and I love the look. Now this one is a little more challenging, not with the amount of work, but rather with my thought process. I do not know what I wanted! Haha... 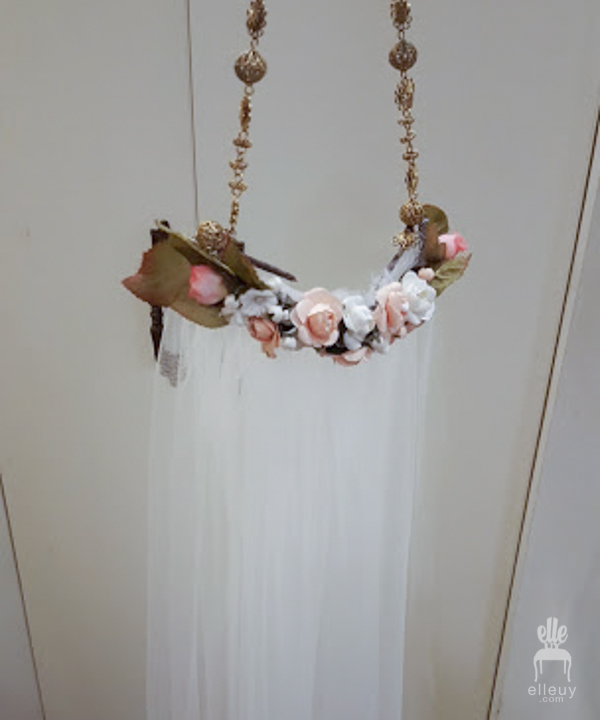 Originally, I wanted to wear a floral crown for the ceremony. But I was quite swayed by friends to have a veil since it's the only time you can actually wear a wedding veil right? But I was firm on not having the normal kind since I'm not really comfortable having a fabric over my face, but that's just me hehe.. So I searched and searched for inspiration and found one I love. I wanted a veil at the back and some sort of headband look where the veil is attached. This one's what I came up with. Originally this was lace, but upon insistent of many trusted friends, I change it into this soft tulle. The lace is just too busy. Haha.. The flower at the back is originally the floral crown that I'll use, but I gave the wrong measurements so I doesn't fit me. 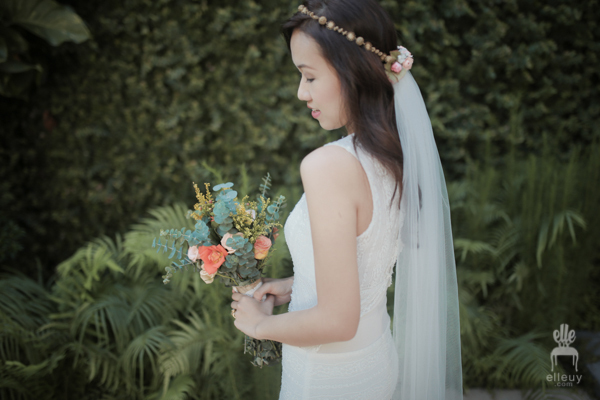 Ordered that and all our other floral crowns from Moonbeam by Polina. :). So i retrofitted the crown and used it as accent for the veil. I knew from the start that I'll be doing the flowers. ALL OF THEM. Haha.. 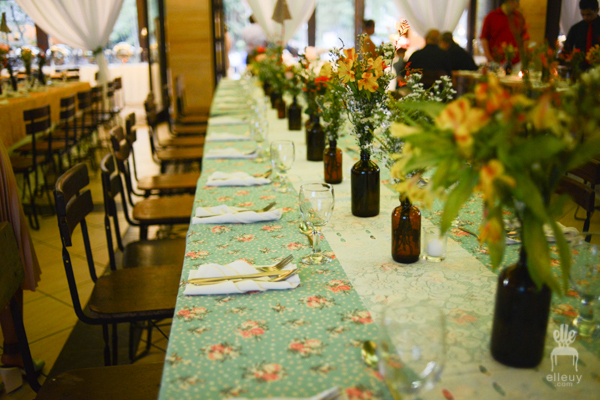 Okay, you might think I'm crazy but I figured, I only have a few entourage, and our centrepieces are just amber bottles with random flowers, so I thought, how hard could it be?? 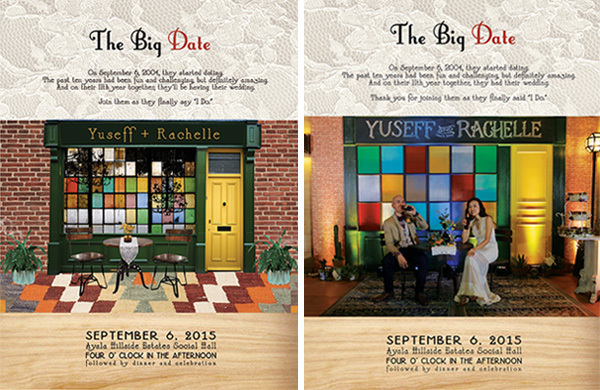 Again, we're not going for the traditional invitation, since well.. we're not going for a traditional wedding hehe... I knew that all I wanted was 2 pages, one main invite, and the other for all additional details. One very important detail is the design itself. 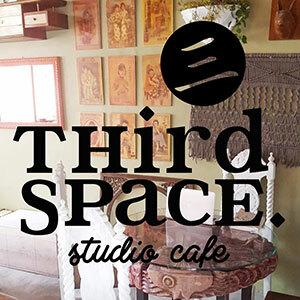 You see, while planning for our venue styling, I designed some mood boards of the cafe backdrop we talked about for the reception. 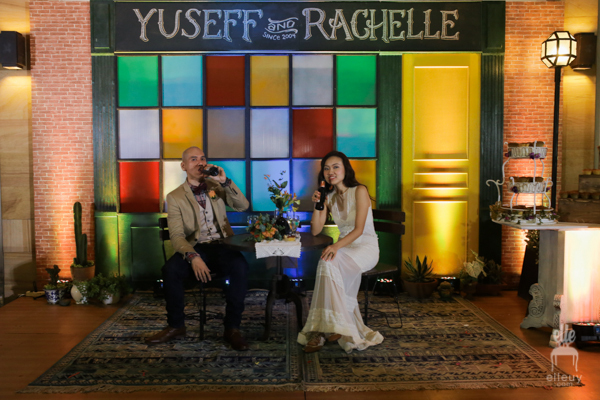 Then when the time came to design the invitation, I thought it would be cute to use our backdrop as its graphic so the invitation and the wedding itself would match. 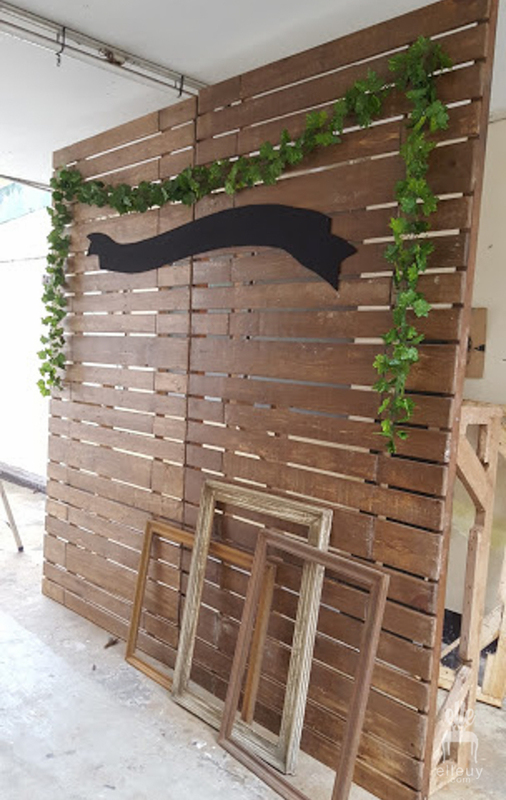 When the invitation was printed, we had no choice but to replicate and push through with our backdrop idea or else the invitation wouldn't make any sense hahaha! 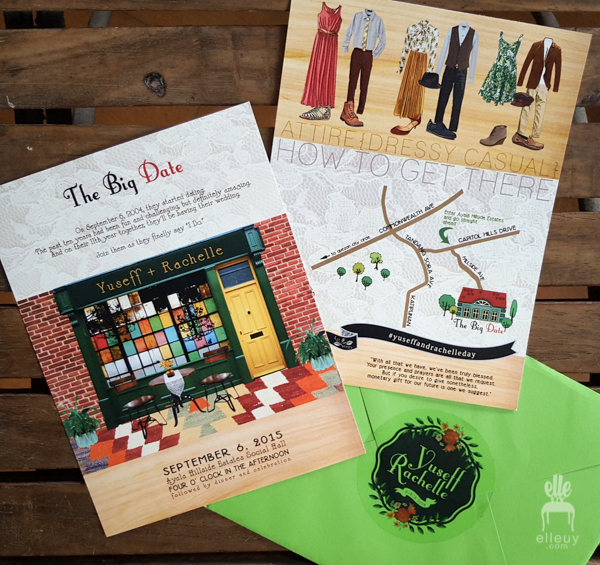 We had this printed by a very good friend who does invites, and she gave us a huge discount (thank you! ), and I just bought the envelopes from National bookstore. I then risked it by doing the addressing of envelopes using marker pen! Haha.. That's one great thing about a laid-back wedding, everything doesn't have to be prim and proper. 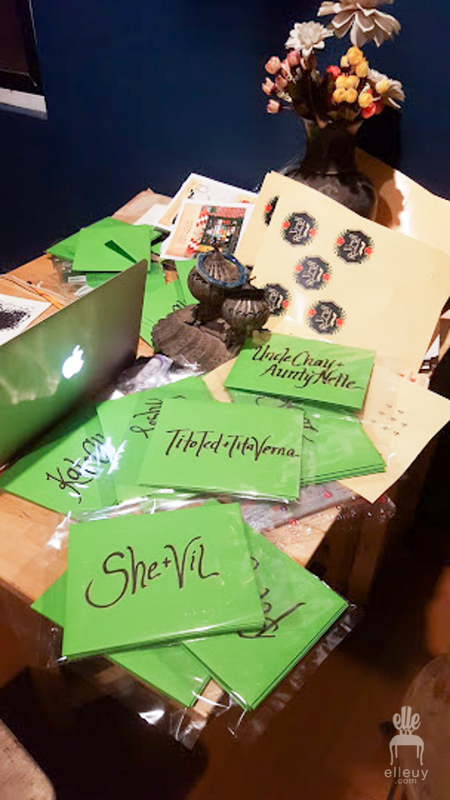 My hand-writing was far from calligraphy invites, but it will do. hehe.. I added a shadow lining using brass pen to make it a little more festive. 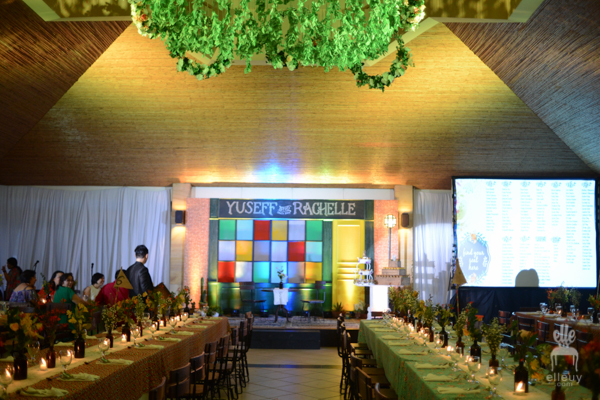 As I mentioned earlier, Yuseff's sister do provide backdrops/props/foodcarts for events, so we've got some options that we can use. 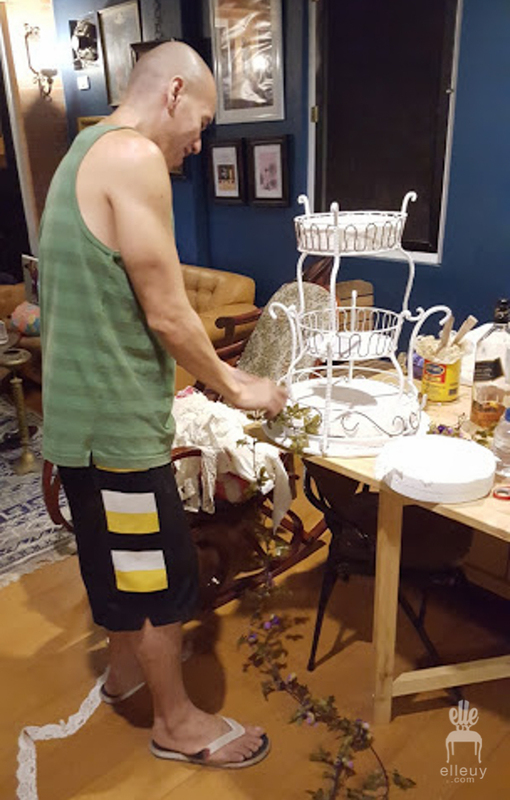 We just bought a handful of vine garland to be used here and the ceremony, and used our old frames as props. Here is it set up on our garage for the trial. 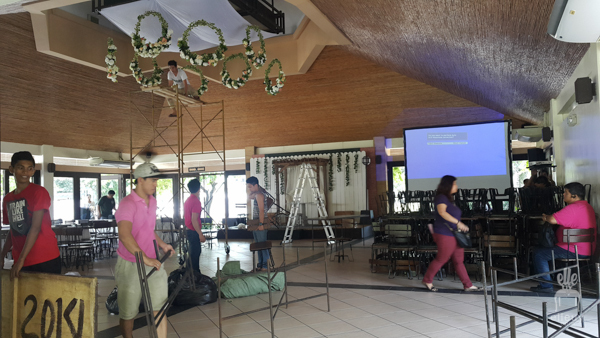 Here it is being set-up on the venue. Now, here it is all done. We wanted to do the backdrop ourselves so we just hired out the cam/printer set-up for the photobooth. We also got my friend for that. We added some wooden animal head that we have lying around the house. It just adds a little more playfulness to the set-up. 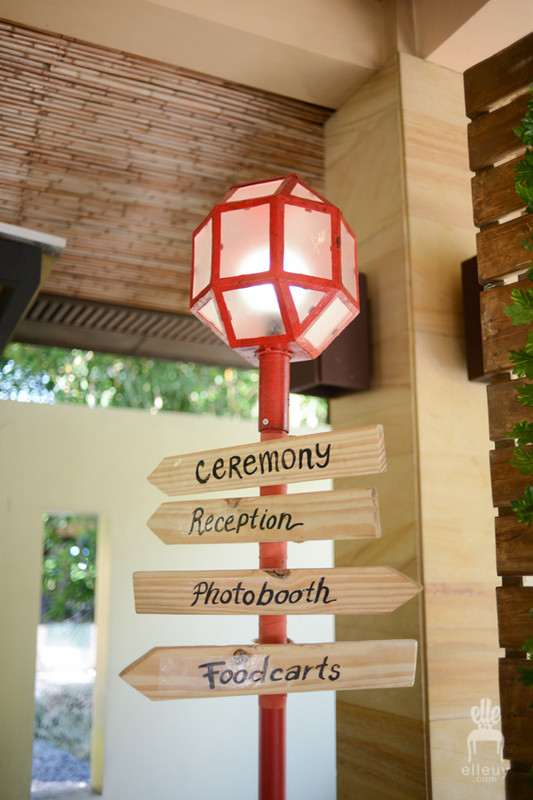 One was placed beside the photobooth, near the entrance, so we used that to put in directional signs as well. 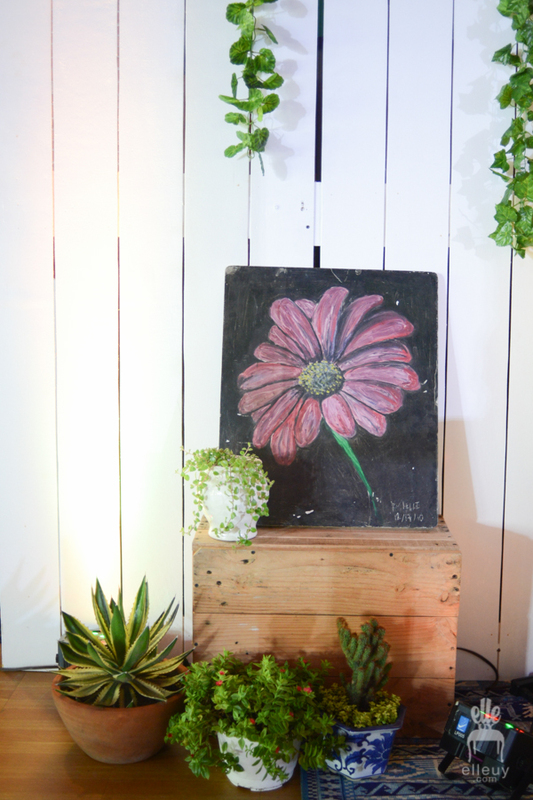 The other one, which was painted black, was used for the ceremony and reception backdrop which you'll see later. 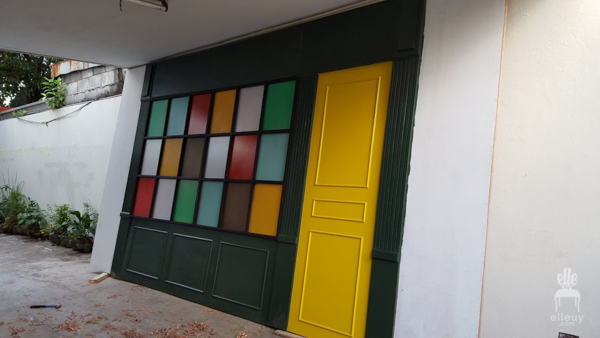 I sometimes enjoy doing chalk art, I did one for my dad's restaurant. So obviously, I'll do some for the wedding.. Hehe.. One is for the photobooth backdrop as you've seen on the photos above. Then there's the welcome signage. Set this up on the entrance, and since we already got the owl ceramic stool, we used them to decorate and act as bride and groom. Haha.. The food carts are from Yuseff's sister that she rents our for kiddie parties. I also designed these carts some time ago, and I do the signs for them even before. But since ours is a wedding, I wanted it to be a little more elegant so instead of using my usual colorful and playful fonts, I made it somewhat a little more vintagey and subdued. We have a few games so of course it means we need to provide prizes. 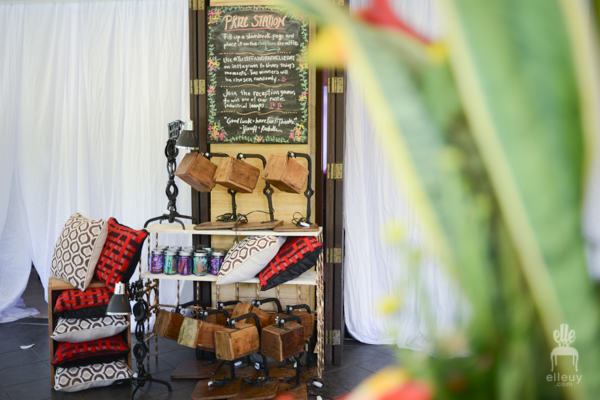 We wanted it to be home decor related because that's what we do, so Yuseff designed the lamps and had our workers do them, and I had the throw pillows made. 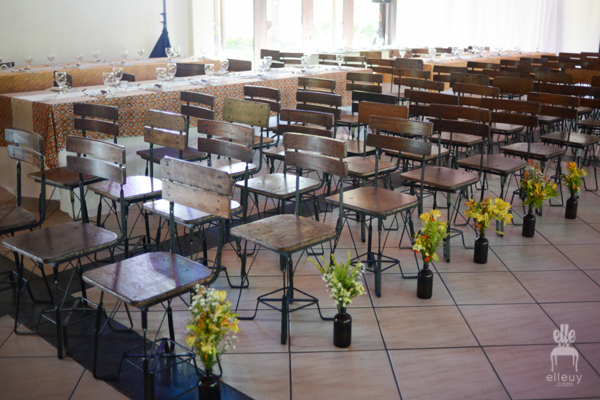 Of course, this isn't a DIY, but I'm sure only a few people can say that they used their own chairs for their wedding. :) I'm not really into tiffany chairs, and other options are soo expensive. So we just rented two trucks to haul these chairs and some props to the venue. 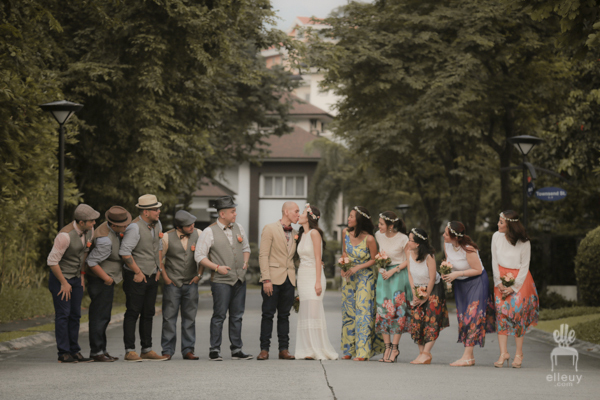 It worked out great since we love the industrial vintage look! Can't imagine using any other chair. Now why and how we got to own 200 vintage industrial chairs is another story. 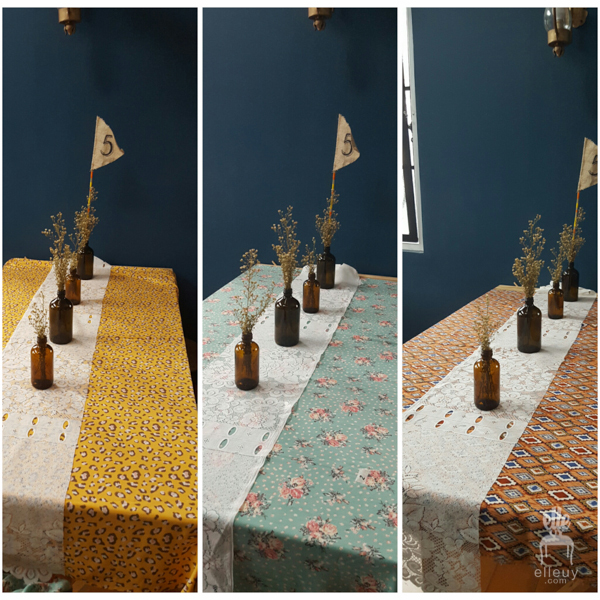 Since I'm going for a bohemian eclectic look, I wanted to use patterned table linen. I think it's cute, plus I get to shop for fabrics! And, I'm sure you're sensing a pattern here, we don't want everything to match. 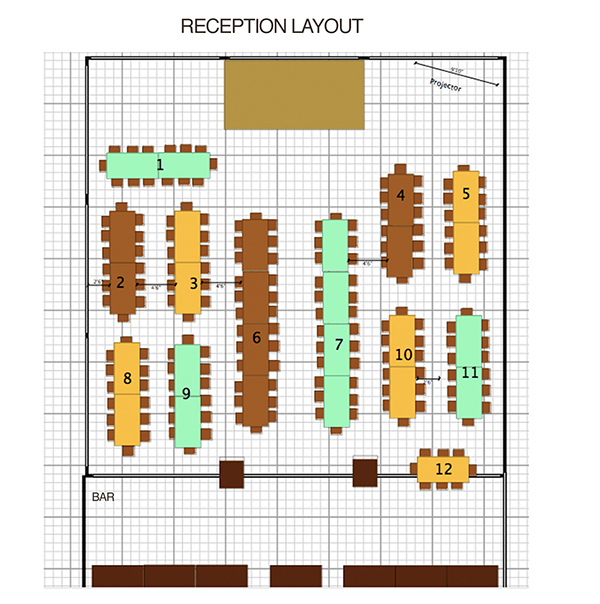 So we chose three different but complimentary pattern, and I just laid it out in the floor plan so the set-up crew would know which pattern to use for which table. Also bought a lace curtain and cut it up to be a runner. As for the centerpieces, we just bought a lot of amber bottles to be lined up in the center and ask the caterer to provide tealight candles. 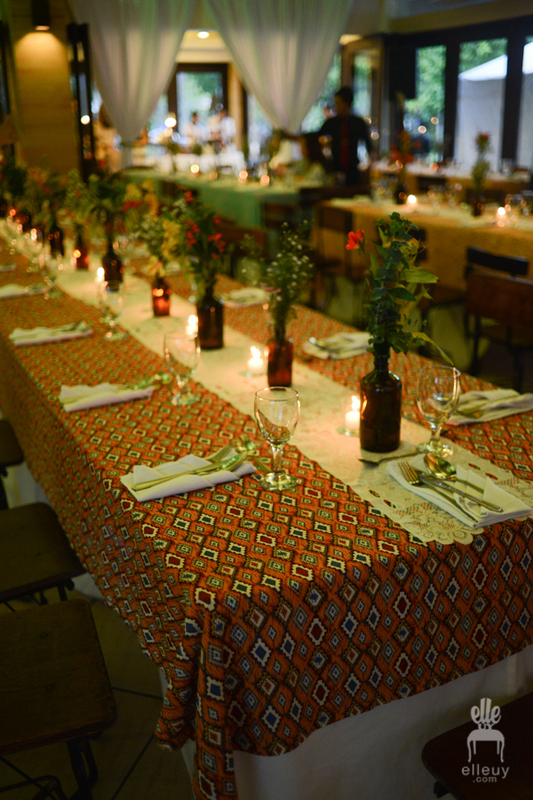 Plus the flag table numbers I made were put up in the center bottle. 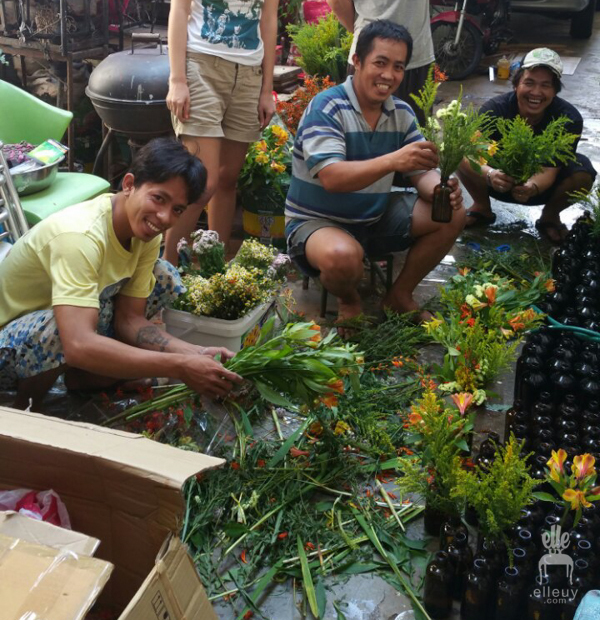 Here we are arranging all the flowers we bought from dangwa the day before. I made a few arrangement but since I'll be doing the bouquets, I left it up to these boys. 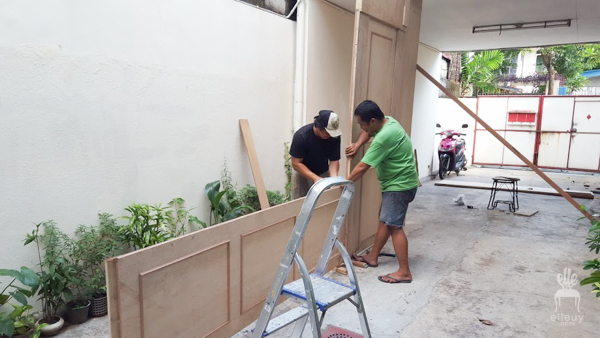 :) Yes the same workers who constructed our house were our florist for the day haha.. They did a great job by the way. As I said earlier, this whole set-up came up organically. 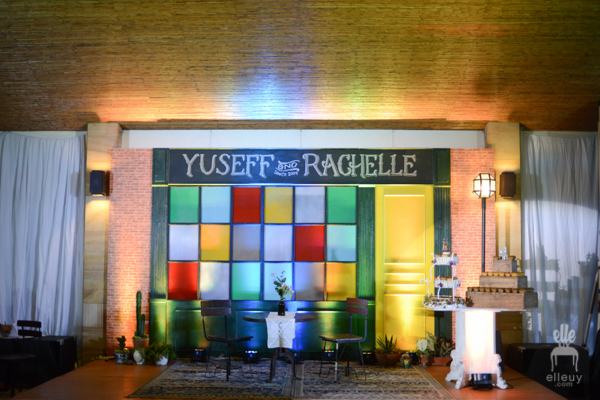 Yuseff's sister had the white fence way before, so I thought we could use it for the ceremony. But that's the only idea I had then. 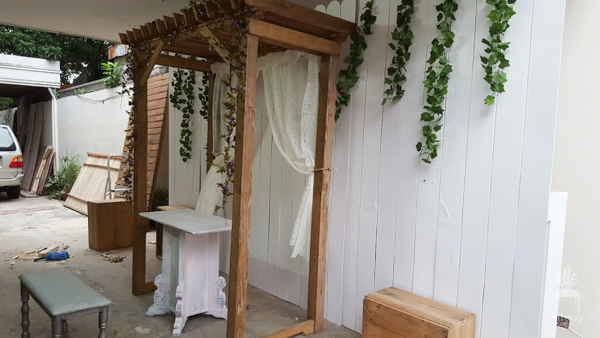 Then a month before the wedding, his sister had this pergola made for her business, and I asked if we can use it as well. 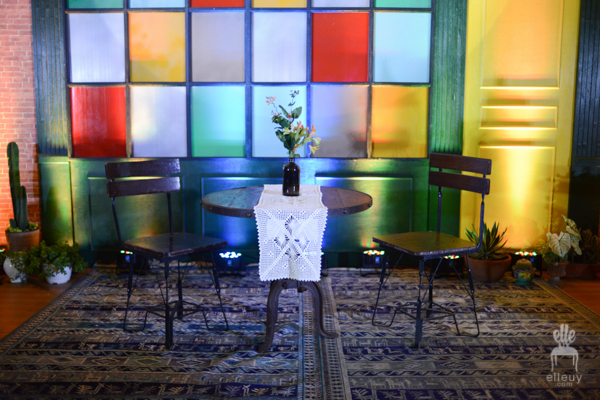 We had the altar table and bench made from our scrap furniture pieces/ materials. We bought leaves garland to decorate and here it is set-up in our garage for trial. Now here is the crew setting up the venue for the ceremony. All done. My friend lend us her plants to add life to the set-up. The other lamp post is placed on the right side of the stage. You'll also see the reception backdrop peeking behind the white fence. We set those up first so after the ceremony, they can just remove the fence and reveal the other backdrop. It's bright, simple, yet a bit playful at the same time. When I saw this, I felt so giddy I can't contain my excitement. It's gorgeous! Hehehe.. The brick wallpaper is yet to be installed on both sides. 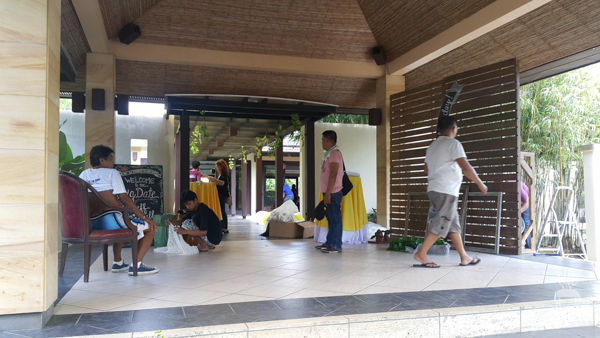 Here they are setting up the area for the reception. When I saw this photo, I'm so relieved that no guest were waiting here. They all went out for cocktails! I was a bit worried that guests would have to sit and watch all this chaos going on, but thankfully they went out, ate, and mingled. Oh we also used the area rug I bought for the Tiny House. Thank goodness I bought two so it filled up the space better. The crank table is our coffee table here at the house as well. 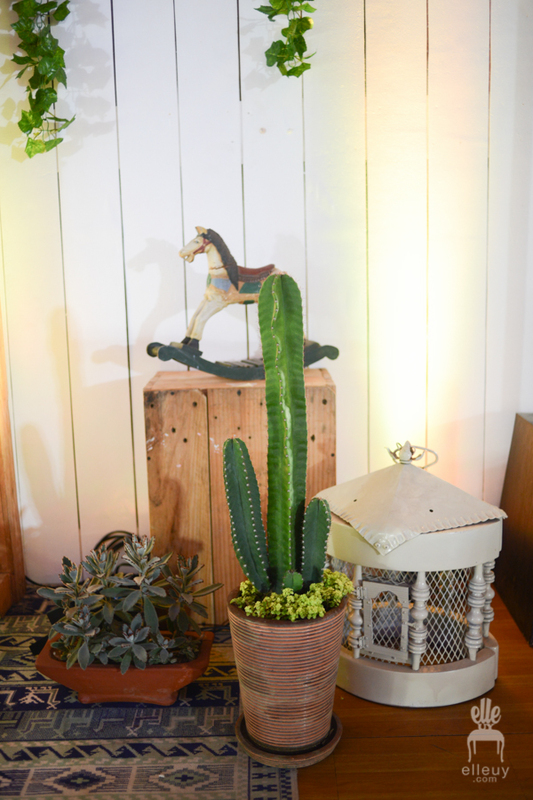 We wanted to bring as much of our own stuff to personalized the venue. It turned our beautifully. It's really more than what we expected. I had envisioned the look in my mind way before the day, but nothing beats seeing it in real life. 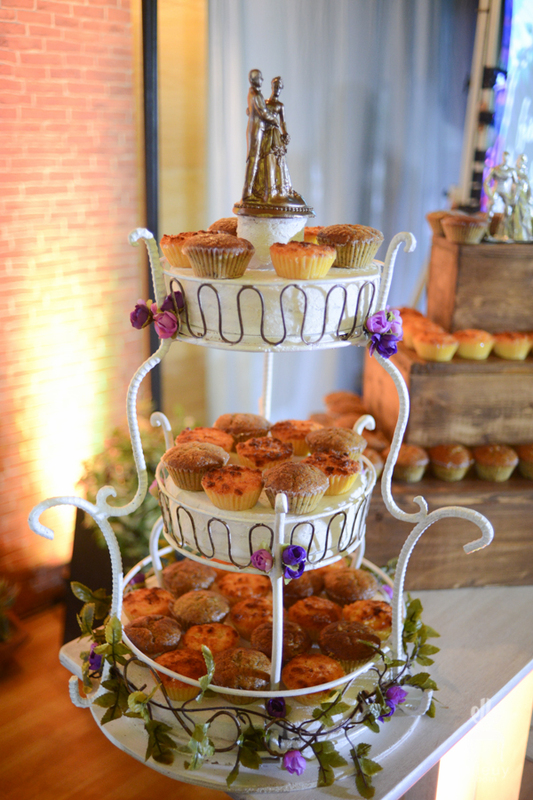 So we needed to make a cupcake stand. I had the wood stand made, and he had the metal stand made. Since we already had the two, we decided to use both! ;) Here is the sample set-up that we're trying out to see if it will fit the table. 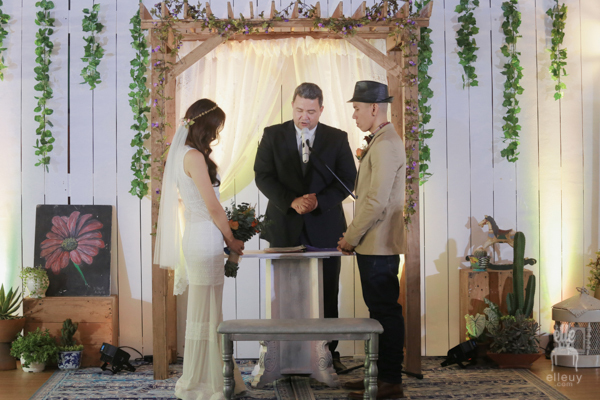 You see, the altar table for the ceremony was the cake table for the reception so we have to work with it. It fits!! 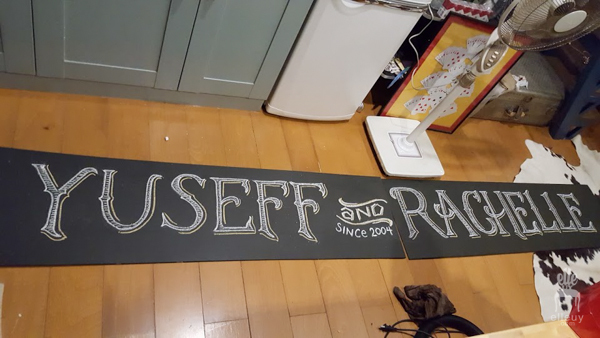 Yuseff decorating the stand. 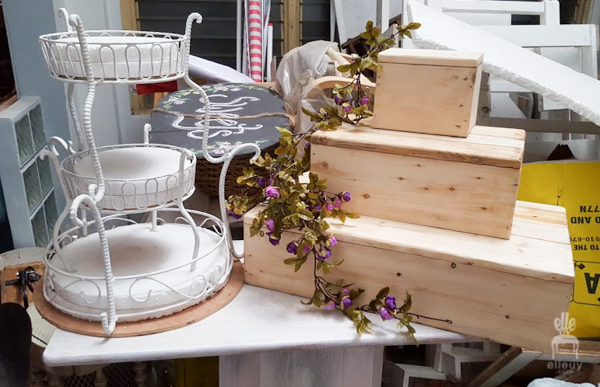 This stand are actually old planters they had lying around, he had them welded together to form this cake-like shape. He didn't want this photo posted because... and I quote "Mukha ako mashadong nag eenjoy!" Bwahaha! But I insisted so here it is... I think this was 3 days before the wedding. Love it!!! 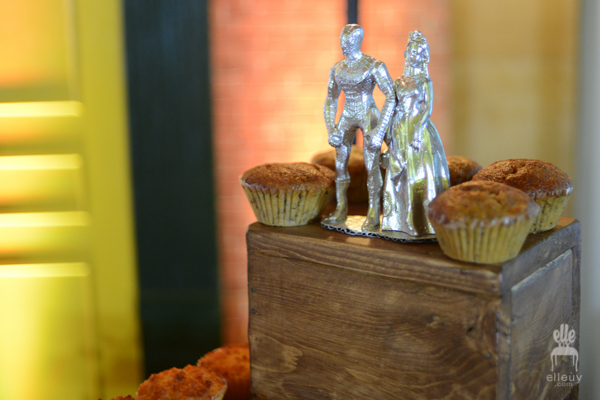 We also bought cake toppers and spray painted them silver gold. We also DIYed some stuff that you can't see in the photos. We showed 3 videos -- growing up/us/friends/family, proposal video, and the SDE. We edited the 2 vids. Not actually us, but we enlisted the help of one of my brother who's taking up multi media art to do those. He stayed with us in the Tiny House for 4 days to finish everything. We art directed but he did all the technical stuff. Thank you brother dear! For the music, we put all the music we wanted played in a usb. From ceremony, cocktail hour, to reception. I just put them in different folders and labeled them accordingly so there'll be no confusion. We carefully chose the special songs like the dances, march, etc. But for the cocktail and dinner music, we just played songs in a reggae rendition. It suited the mood. As for the games, we did the "guess the movie title" and "chinoy henyo." So we compiled movie clips that Yuseff chose, and we made images of our chinoy henyo words to be shown on the screen for the game. It was fun! I can't wait for the videos. Sooooo.... I think that's about it?! Haha... We did a lot for the wedding, but it doesn't feel like much. 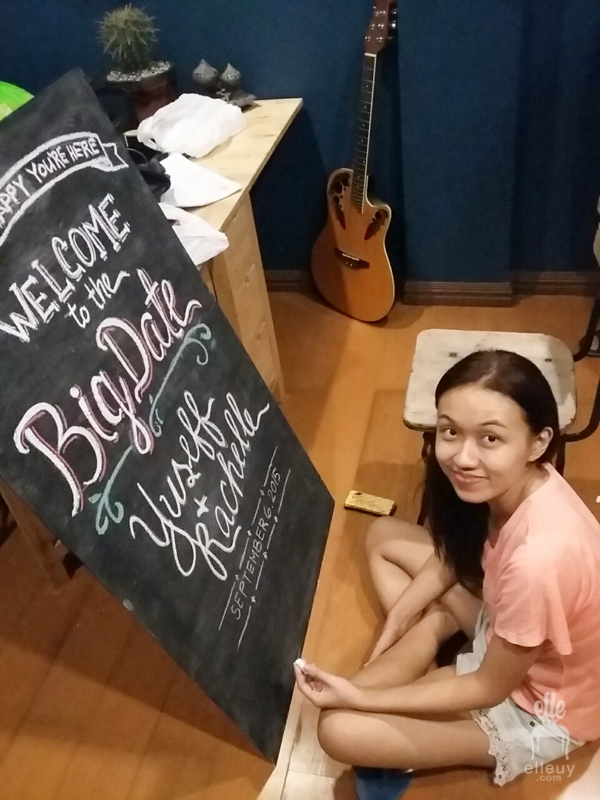 It's so worth it to go through our big day, seeing all our hard work being enjoyed and appreciated by everyone. 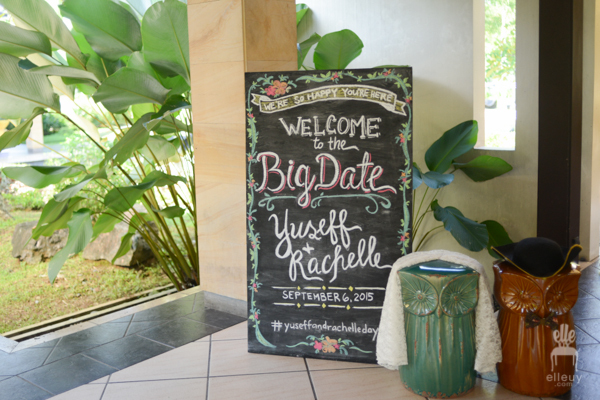 We got to personalize it and we got the wedding we dreamt of. 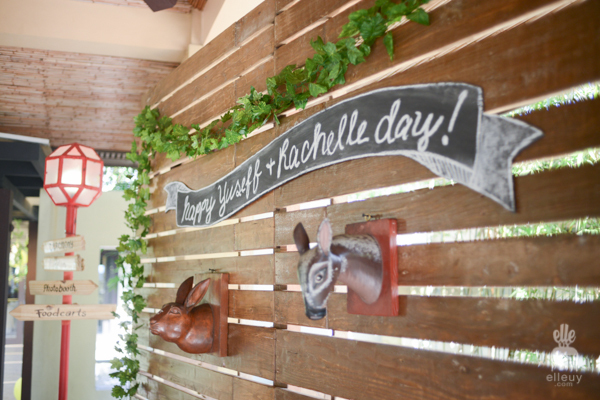 It's not just the concept or DIYs that made this day special, it's just the over all vibe, and love we felt through out the day. 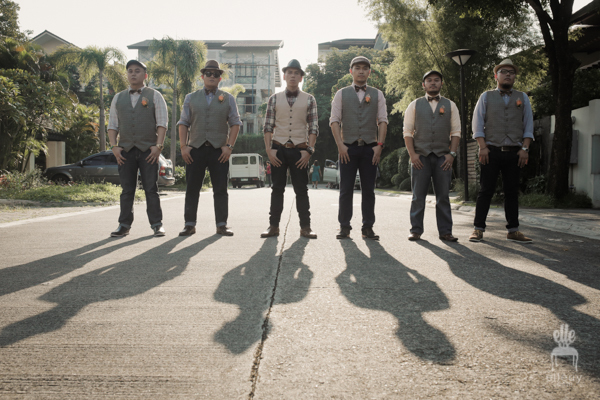 My last wedding post will be the supplier reviews, budget, and our SDE. After that, we'll be back to regular programming. Hopefully! !